Chicken Matar Masala, chicken and green peas is one of the famous combination. This is a simple dish to make for a weekend special. Adding green peas to chicken will give a nice flavor and taste. We can also follow the same method to make mutton matar masala but the only difference would be, we need to cook mutton for more whistles. This curry will taste good with both rice and chapati/roti. Ginger Garlic Paste - 1 tbsp. Chicken Masala - 3/4 tsp. Red Chili Powder - 1/2 tsp. Cumin Seeds - 1/4 tsp. 1. 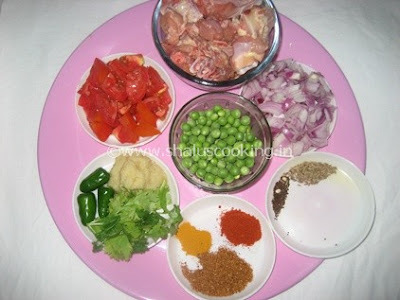 Keep all the ingredients ready to make Chicken Matar Masala. a. Wash and clean the chicken pieces. c. Roughly chop the tomatoes. 2. Heat oil in a pressure pan and add mustard seeds. When the mustard splutters, add the cumin seeds. Once the cumin seeds sizzle, add the onions and saute till they are transparent. Add the green chilies. 3. Add ginger garlic paste and saute till the raw smell vanishes. 4. Add the chicken pieces and turmeric powder. Saute till the chicken changes to pale yellow color. 5. Add chili powder, chicken masala powder and turmeric powder. Mix it well. Now add the chopped tomatoes and salt. 6. Cook till the tomatoes become soft. Add little water and close the lid of pressure pan. Pressure cook the chicken for 2 to 3 whistles. 7. When the pressure is completely release, open the pressure pan and place it on the flame. Add the green peas to the curry. 8. Cook on medium flame till the green peas is cooked and the water dries up in the chicken masala. Finally add the chopped coriander leaves and mix well. Weekend special Chicken Matar Masala is ready to serve. Serve it with hot steamed rice or chapati/roti.